A girl who never fit in. A boy who never had a choice. A love that defied it all. Anything is possible—that is the message that teen filmmaker Anne-Sophie Dutoit would like to tell the world. 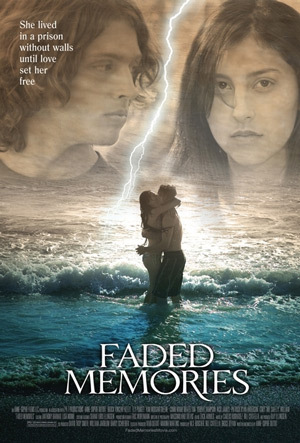 At 14, she wrote her first screenplay; at 16, she saw that vision come to life, when Faded Memories began production in 2007. But not only is she credited with writing the script: Anne-Sophie also directed and starred in the feature film, which is produced by her own production company, Anne-Sophie Films. Faze caught up with the young starlet, to talk about her film and her future in filmmaking. FAZE: Where did the inspiration come from for the film Faded Memories? Anne-Sophie Dutoit: It really came from when I was 14 years old and just seeing everybody around me. I mean, I was always kind of dreaming of love at that time, so that’s where the love story came into place. All the other parts, you know the drama and that, came from a lot of people I knew had actual parents that were like that or aunts, that had alcohol problems, so that’s where that part came in. FZ: What is the message that you would like the audience to take away from your work? Anne-Sophie Dutoit: Well, the message for me would probably be that no matter what your background is, if you have faith, you can always go through anything and come out with a positive attitude. It doesn’t matter where you’re from: it’s just about believing in yourself and everything’s possible. I do movies to inspire people, just to go for what they want, their dream—so that’s my biggest goal in making movies. FZ: Are there any similarities between you in real life and your character, Cassandra? Anne-Sophie: Yes, definitely. The fact that she’s very artistic and kind of a free spirit—I’m a lot like that. She doesn’t really care about what people say about her, that was always a very big part of me as well. And she’s very vulnerable, and everybody can kind of relate to her. FZ: How did you prepare for the role? Anne-Sophie: To prepare, honestly, for me, it was just like going and looking at my lines, just trying to think like she would think. At one point, I was walking around and acting like what Cassandra would do in this situation, so that was the most helpful thing for me. FZ: What was the atmosphere like on set? Anne-Sophie: On set, it was very stressed, because we had to go fast, for time. We didn’t have time to actually relax (laughs). It was hectic, but I actually really like it, because if everybody’s “oh, chill,” and all that, then no work gets done. After the first week, you kind of bond with a certain group of people and they become kind of like your family. At the end of the shooting, I was so sad, because all these people had become such a big part of my life. FZ: What was the schedule like for each day? Anne-Sophie: We were shooting 6 days a week. I remember, I was waking up at 5:00 in the morning; I was on set at about 7:00. We would all eat together, and then I would go and look at the breakdown of the scenes. I would meet with my DP in the morning, and we would talk about all the shots of the day. We would just shoot 2 or 3 scenes in the morning, then we would go and have a lunch break. And then shoot 3 or 4 scenes in the afternoon. Sometimes we would have night-shoots—the night-shoots were kind of crazy because we had bring big lights and one time we stayed ‘til like 3 or 4 in the morning! FZ: Did you ever feel overwhelmed on set, jumping in and out of so many roles? Anne-Sophie: I guess for me, I never really did feel that way because I don’t really think much of how I feel, because I love it so much. FZ: What was the most difficult part to film? Anne-Sophie: When it was the scenes with all the extras. That was, you know, kind of crazy, ‘cause some of the extras would talk, and we would always have to say “Silence!” and things like that. When there’s a large group of people that come in, it’s always more hectic to try to tell them what to do, and if they don’t do something well, like let’s say one of them looks at the camera and then you see it, we have to re-shoot it. FZ: What is your favourite scene in the movie? Anne-Sophie: My favourite scene is definitely the crazy scene. We were actually in a real asylum, where mental patients used to be, so the vibes there were really freaky. Some people said that they saw ghosts. 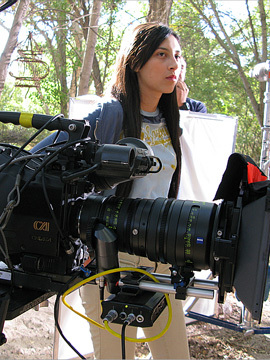 FZ: How do you feel about being labeled a “teen” filmmaker? Anne-Sophie: I am definitely proud, but I think that sometimes people talk so much about my age, and at the end of day it’s just about my drive. It’s not because of my age that I’m where I’m at, it’s just my drive. So, sometimes I just wish people would realize that anybody can accomplish what they want if they have drive and they just have a goal. If you have passion, no matter how many doors you knock on and they say no, you’ll still continue. FZ: Out of the 3—writing, directing and acting—what would be your favourite? Anne-Sophie: OMG—I really can’t pick. Honestly, that’s why I’m doing all of them; if I’m just doing one, I miss the others! FZ: It doesn’t sound like you have much free time, with so many great things going on, but what do you like to do on a day off of work? Anne-Sophie: I usually just hang out with my friends and my family—sometimes I like to do roadtrips, or go out shopping, or see a movie—just regular things! I always find time for my friends, at least once a week, for sure. FZ: What are your goals for the future? Anne-Sophie: My second movie, Blue Winter; I’m probably going to do that in September. My long term goal is to have my own studio; I have my own production company, Anne-Sophie Films, and it’s just basically to expand that, and help people, because that’s my main thing. I raise awareness for special-needs kids, I put them in my movies, and I’m going to do a fund for them. Also, just to inspire people and help other filmmakers and produce their films.